M8s Footy is back in 2019! This FREE, modified, non-competitive, safe and fun form of rugby league will feature again this pre-season down at Nolan’s Reserve. Four consecutive Friday’s in March – 1st, 8th, 15th and 22nd March at Nolan’s Reserve. Games will kick off at 5pm each night and the finish time will depend on registrations but should be about 7:30pm. This fun program is designed for new players to team rugby league. 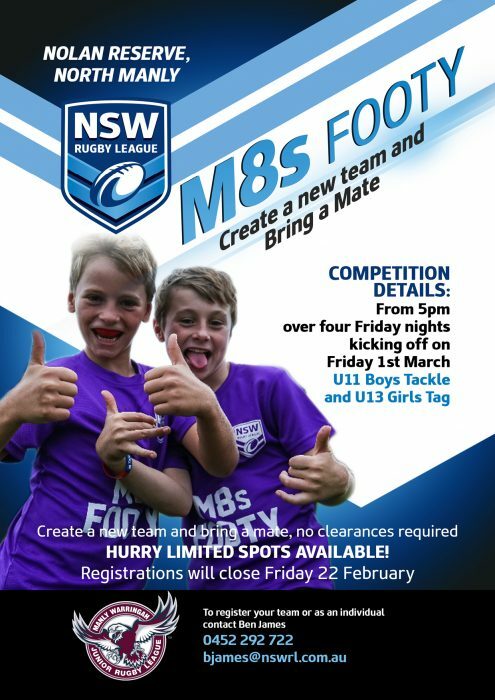 If your child already plays rugby league, this is an opportunity for them to recruit mates who would be new to club rugby league. All you have to do is gather a group of 8 kids to form a team, then register. Hopefully this will encourage new members to Manly Brothers and the club comp series. There will be two divisions; U11 Boys Tackle and U13 Girls Tag. Each team in these divisions will play two games per night – a total of 8 matches across the program. Boys can play two years above their natural age group and girls can play tag three years about their natural age group. Teams will consist of a maximum of 10 registered players – 8 players on the field at a time. Matches will be played on a touch football sized field. For all other rule modifications please read the attached rules document. There will be no coaches or trainers for these teams – Just kids being kids and playing footy with minimal instruction from us adults. Each team will receive a set of coloured shirts on the first night that will be used for the games and kept afterwards. Each team will receive a football they must bring to each game. Games will be overseen by experienced Sports Trainers who’ll provide first aid when needed. Once registered all participants will be covered under the NSWRL Junior League Association insurance.